Florida | Stop Dog Whistle Racism! THE THREAT: HERE IN TEMPLE TERRACE, FL OUR REPUBLICAN HQ IS ONE BLOCK AWAY FROM OUR LIBRARY, WHICH IS AN EARLY VOTING SITE. 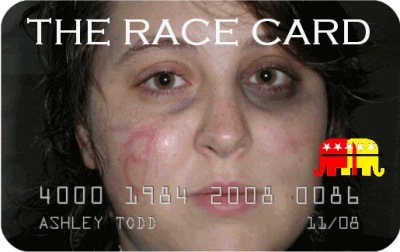 I SEE CARLOADS OF BLACK OBAMA SUPPORTERS COMING FROM THE INNER CITY TO CAST THEIR VOTES FOR OBAMA. THIS IS THEIR CHANCE TO GET A BLACK PRESIDENT AND THEY SEEM TO CARE LITTLE THAT HE IS AT MINIMUM, SOCIALIST, AND PROBABLY MARXIST IN HIS CORE BELIEFS. AFTER ALL, HE IS BLACK–NO EXPERIENCE OR ACCOMPLISHMENTS–BUT HE IS BLACK. Notice again the level of racialized emotion in this message. Today, some conservative Republicans are back to fighting a Cold War against “Marxism,” a theme that is part of the national McCain-Palen attack line. When in difficulty, the U.S. right-wing likes smear tactics that place a political candidate who is obviously a centrist Democrat as “socialist” or “Marxist.” These themes seem to be just some cover for viewing Senator Obama in old antiblack terms, as the harping here on blackness suggests. Most readers have probably seen footage of McCain-Palin rallies in Ohio or Pennsylvania, where voters who could best be charitably as the “low information” variety have wound themselves into tight little knots of fury over the Islamo-Marxist-terrorist menace of Barack Obama. Now that voting has begun, the panic over the possibility of an Obama presidency has apparently pitched to a level that can only be adequately conveyed with a stream of capital letters. Via Open Left, check out this e-mail, sent the other day by the chair of the Hillsborough County (Fla.) Republican Party to his friends and colleagues. Among other things, he’s clearly dismayed that black folks — and college professors! — are fearlessly casting ballots. HERE IN TEMPLE TERRACE, FL OUR REPUBLICAN HQ IS ONE BLOCK AWAY FROM OUR LIBRARY, WHICH IS AN EARLY VOTING SITE.I SEE CARLOADS OF BLACK OBAMA SUPPORTERS COMING FROM THE INNER CITY TO CAST THEIR VOTES FOR OBAMA. THIS IS THEIR CHANCE TO GET A BLACK PRESIDENT AND THEY SEEM TO CARE LITTLE THAT HE IS AT MINIMUM, SOCIALIST, AND PROBABLY MARXIST IN HIS CORE BELIEFS. AFTER ALL, HE IS BLACK–NO EXPERIENCE OR ACCOMPLISHMENTS–BUT HE IS BLACK.I ALSO SEE YOUNG COLLEGE STUDENTS AND THEIR PROFESSORS FROM USF PARKING THEIR CARS WITH THE PROMINENT ‘OBAMA’ BUMPER STICKERS. THE STUDENTS ARE ENTHUSIASTIC TO BE VOTING IN A HISTORIC ELECTION WHERE THERE MAY BE THE FIRST BLACK PRESIDENT. THE COLLEGE PROFESSORS, PARTICULARLY IN THE SOCIAL SCIENCES, FOR THE MOST PART HAVE LITTLE OR NO EXPERIENCE IN THE WORK-A-DAY WORLD. THEIR LIFE EXPERIENCE HAS BEEN MOSTLY ACADEMIC UNDER THE TUTELAGE OF LIBERAL COLLEGE PROFESSORS. FOR THEM, A LITTLE SOCIALISM AND ANTI-AMERICANISM IS A GOOD THING. AFTER ALL, IF TERRORISTS ATTACK US, WE MUST HAVE DONE SOMETHING TO PROVOKE THEM. YOU AND I UNDERSTAND THE DANGERS THE POTENTIAL OBAMA PRESIDENCY PRESENTS TO OUR WAY OF LIFE. THE SUPPRESSION OF FREE SPEECH, INTRODUCING UNION INTIMIDATION IN THE WORKPLACE, INCREASED DANGERS TO OUR NATION BY TERRORISTS, CUTTING OUR DEFENSE BUDGET BY 25%, TURNING OUR TAX SYSTEM INTO A NATIONAL WELFARE SYSTEM AND ECONOMIC POLICIES THAT COULD DRIVE US INTO A DEPRESSION. ONLY YOU AND I CAN STOP OBAMA NOW ! ! SEVEN DAYS TO GO AND WE MUST ACT IMMEDIATELY..
VOTE. OBAMA IS ADVERTISING ON TV ASKING ALL HIS SUPPORTERS TO TAKE A DAY OFF WORK OR CLASS TO VOTE. CONTACT PERSONALLY EVERYONE YOU KNOW REMINDING THEM TO VOTE AND HOW IMPORTANT IT IS. PARENTS, VOTING-AGE CHILDREN, IN-LAWS, CO-WORKERS, CHURCH CONTACTS, SCHOOL CONTACTS, BUSINESS CONTACTS. MAKE A LIST AND CONTACT THEM. SEND THIS MESSAGE TO EVERYONE ON YOUR EMAIL LIST THAT WANTS TO DEFEAT OBAMA. YOUR EMAIL IS AN EFFECTIVE TOOL IF YOU USE IT WISELY AND PROMPTLY. YOU CAN REACH 10,000,000 PEOPLE IN THE NEXT SEVEN DAYS IF AS FEW AS TEN PEOPLE ON YOUR LIST TAKE PROMPT ACTION AND TEN PEOPLE ON THEIR LIST AND TEN PEOPLE ON THEIR LIST…YOU GET THE IDEA. LET’S ALL PRAY AND WORK AND WE WILL SURELY CELEBRATE OUR VICTORY ON 11/5/08. Last week, the South Florida Times reported on the black people in Republican presidential nominee John McCain’s family. Shortly thereafter, The Wall Street Journal, CNN and other media outlets around the world did follow-up reports. Among other things, our research confirmed that McCain’s family owned and operated a slave plantation in the Teoc community of Carroll County, Miss. called Waverly, during the late 1800s and beyond the turn of the century. McCain’s ancestors were cotton barons. Archived records use “mulatto” and other terms to describe some of the enslaved Africans his family owned, thus documenting their mixed races. The black, white and mixed-race McCains, including Sen. McCain’s brother, Joe, and countless other family members host reunions in Teoc every other year. Sen. McCain, however, has never acknowledged his family there, and never attends the events, according to family members who have attended. He has not explained why. The second piece of literature, paid for by the Republican Party of Florida, provides a new line of attack. 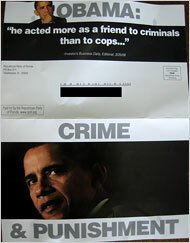 It alleges that Senator Obama would be soft on crime. Few issues are as racially radioactive, especially here in Miami, so it is worth asking: Does the flier go over the line?